Within a reef facies topographic highs will be produced as shallow water corals grow faster than deeper water forms and sediment accumulation will be reduced on higher platforms (Scoffin et al., 1978). These topographic highs are also subject to increased water circulation, which stimulates ooid formation, while the lows tend to be less energetic where muds preferentially accumulate. The presence of antecedent topographic features will hence influence the growth patterns and position of modern reef complexes (Figure 1). Figure 1. 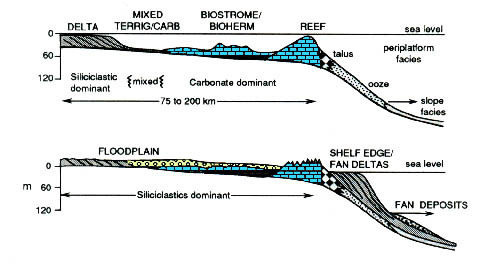 Cross-section illustrating development of modern reefs upon pre-existing topographic highs of Pleistocene limestone (After James and Ginsburg (1979). Older Reefs: Includes the development of modern day reef structures atop older reefs from the Late Pleistocene which formed exposed platforms that were later submerged during the last rise in sea level following. These modern complexes preferentially grew on the topographic residual of the earlier reefs. Examples of such features can be found at the Great Barrier Reef, and off the coasts of Florida, Belize, and Bermuda. Erosional Terraces: Erosional terraces were produced throughout the Pleistocene when sea level low-stands allowed for wave erosion along many coastal zones. Reef organisms later colonized these etched terraces when the sea level rose (Goreau and Land, 1974). Siliclastic/Volcanic Topographic Features: New reef growth has taken place on these earlier depositional features. These may be volcanic in origin, as in the case of Pacific Atolls or, as in the case of the reef structures in Belize, upon the river terraces of the Pleistocene. Figure 2. 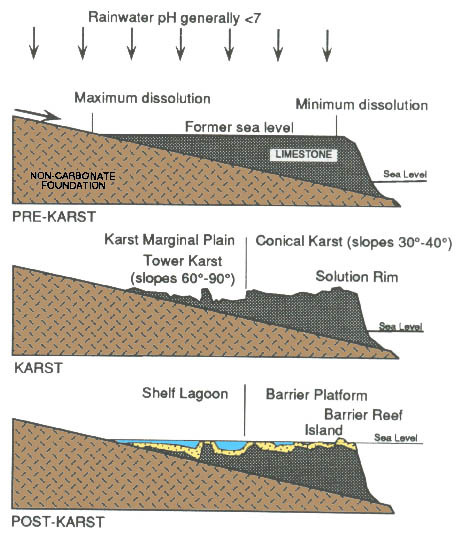 Illustration of the evolution of karstic topography from limestone platform exposure (drop in sea level) to dissolution to occurrence of modern reef structures upon later transgression (after Purdy, 1974). 4. Karstic Topography: Karst terrain occurs when sea level low-stands allowed for prolonged subaerial exposure. As illustrated in Figure 2, slightly acidic rainwater falls atop and dissolves the exposed carbonate shelf. Maximum dissolution occurs where runoff is most concentrated. Although the composition of the exposed carbonate shelf does influence the extent of karstification, the major control is climate. Karst is most common in carbonate terrains in humid regions of all kinds (temperate, tropical, alpine, polar), but is most commonly seen in warm, wet, tropical climates. These tropical climates are most susceptible to karst formation because although calcite and CO2 solubility both decrease with temperature, high temperatures generate greater CO2 production, which in turn offsets the diminution of CO2 solubility, thus increasing the acidity (H2CO3) of the rainwater which is delivered more frequently in humid regions. Karst development is, however, not always associated with subaerial carbonate exposure. Also associated with sea level low-stands is a progradation of terrigenous sediment. A blanketing of the exposed carbonates by siliclastic sediments will occur within the carbonate topographic lows, this limiting the rainwater dissolution effects to the exposed topographic highs (Figure 3). Figure 3. Siliclastic deposition upon regression and it's influence on karst formation, Northeast Australian Platform (from Davies et al.,1989).